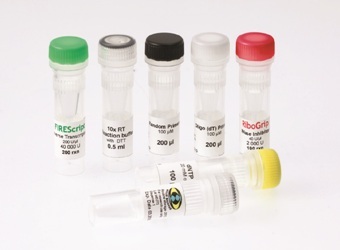 FIREScript RT cDNA Synthesis Kit contains all the reagents you need to synthesize cDNA in 7 separate vials. Its fast reaction speed allows you to perform your synthesis in just 15 minutes while the high working temperature of the enzyme (up to 60 ºC) ensures high yield and great sensitivity. The kit format allows flexibility including the preincubation of complex RNA. You can order samples without logging in! You need to be logged in to order products! 06-15-00050 50 rxn PDF PDF PDF 115 EUR Login to buy! 06-15-00200 200 rxn PDF PDF PDF 407 EUR Login to buy! 50% glycerol (v/v), 20 mM Tris-HCl pH 7.5 at 25 ºC, 100 mM KCl, 0.1 mM EDTA and stabilizers. Shipping and temporary storage for up to 1 month at room temperature has no detrimental effects on the quality of the reagents. Send an e-mail directly to our technical support and you will get answered in 24 hours (on working days). Some applications this product is used in may require a license which is not provided by the purchase of this product. Users should obtain the license if required. Copyright © 2019 Solis BioDyne. All rights reserved.